All sales of clear acrylic tubes are final. No returns, no cancellations. Note: The difference between CAST and EXTRUDED acrylic is that CAST is perfectly smooth, like glass but only better. EXTRUDED acrylic is also clear like glass, but it will have very small extrusion markings running the length of the pipe. Generally you have to be very close (6" or less) to see them, but they are there. Most people don't even notice the markings on the clear rigid tubing. :-) If you are planning to expose pipe to the sun or high ultraviolet light, check out our selection of UV-resistant PVC pipe. 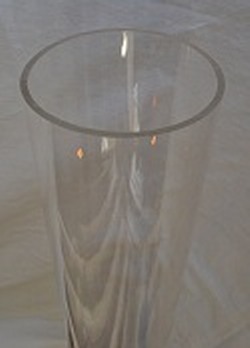 Closeout, limited to stock on hand: This rigid tubing is clear (clear like glass) acrylic that will fit 3" sch 40 fittings. 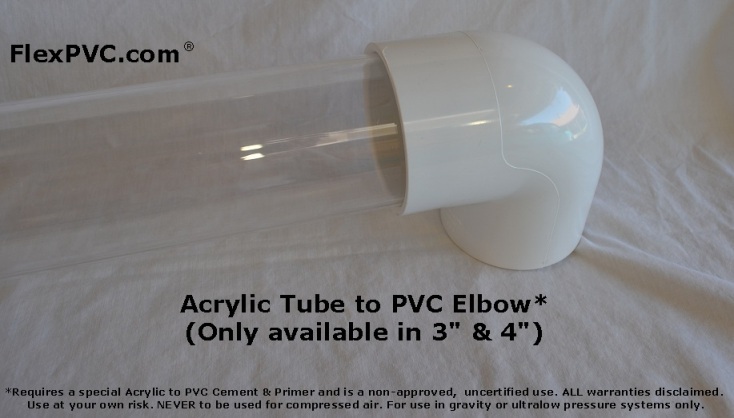 This tube will fit standard Sch 40/80 fittings and if you use the proper glue, it will seal to hold a water column of about 20' (about 10psi). Price shown is per foot. You can specify from 3" up to 6'. #1 This tube is tube, it is not pipe. #2 This tube is not rated for any pressure. #3 This tube is not certified for any type of use other than "display." #4 This tube is has no ratings & nor certifications of any kind. By adding this item to your cart and completing your purchase you acknowledge these stipulations and disclaimers, and accept all responsibility for it's use.